Thai food is widely known for being hot and spicy since almost all Thai food is cooked with basic ingredients such as garlic, chillies, lime juice, lemon grass and fresh coriander leaf and fermented fish sauce (nampla) or shrimp paste (kapi) to make it salty. Since rice is the staple food in Thailand, it is usually eaten at every meal with soups, curries, fried vegetables and nam phrik. Nam phrik is a hot sauce prepared in a variety of ways and differs from region to region : nam phrik pla pon is a ground dried fish and chilli sauce, nam phrik pla raa is fermented fish and chilli sauce, nam phrik kapi is a shrimp paste and chilli sauce, nam phrik oong is a minced pork, tomato and chilli sauce. In general, the basic ingredients of nam phrik include shrimp paste, garlic, chilli, fermented fish sauce and lemon juice. Common seasoning in Thai food include galingale (kha), black pepper, ground peanut, tamarind juice, ginger and coconut milk. Thai food varies from region to region, for example, glutinous or sticky rice is more popular in the North and Northeast than steamed rice. Moreover, in some rural areas, certain insects are also eaten e.g. crickets, silk worm larvae, red ant larvae. At the same time, Thai desserts are often made from sticky rice or coconut milk, flour, egg and coconut sugar while a variety of fruit is available all the year round. Meanwhile, the basic characteristic taste of Thai food in different parts of the country can be described in different ways : in the central region, food is hot, salty, sweet and sour. 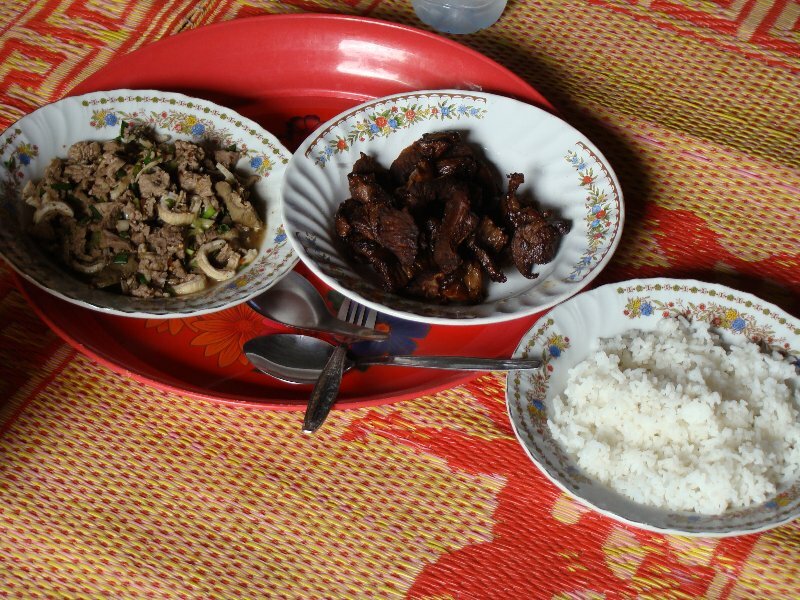 Rice is served with different types of nam phrik and soups e.g. tom yam kung (prawn soup with lemon grass). Thai foods usually contain a lot of condiments and spices. In the North, food is mild or hot, salty and sour, but never sweet. Sticky rice is served with boiled vegetables, nam phrik oong and soups or curries. The North is also well-known for its sausage called “naem” which consists of fermented minced pork. It has a sour flavour and is sold wrapped in cellophane and banana leaf. Food in the Northeast is hot, salty and sour. Their favourite foods include papaya salad (som tam), sour chopped meat salad “koi” , sour minced meat salad (larp). People use a lot of condiments but no many spices. Their meals generally consists of sticky rice and nam phrik pla raa accompanied by a lot of vegetables including those found growing wild. On the other hand, food in the South is renowned for being very hot, salty and sour-tasting. Curries are popular and made with a lot of spices and condiments. Khao yam (a mixture of rice) raw vegetables and fermented fish sauce or boo doo is also a common dish. Generally southern people eat little meat and other varieties of nam phrik are not so popular, the most common one is nam phrik kapi. Check out the gallery for pictures of Thai food.